In the immortal words of Salieri: And then, a miracle! I woke up at the crack of 2:45am courtesy of the hotel wakeup call (which was Mickey again; I kinda missed Baymax). I dressed quickly and was out the door before 3:10am as the race guide now said we had to be on the buses by 3:30am to make our races on time. It used to be 4am, so that was new. There wasn't much of a line and I was on a bus and at the staging area with all speed. As per usual a DJ was trying to pump people up and it was kind of working. Dopey and Mickey and Goofy were all available for photos, but the lines were too long to bother with. And there was now a controlled line for the merch tent, so no warming up in there. Speaking of warming up, temperatures were in the low 40s, so, brisk. But I brought a throwaway sweatshirt and top and compared to the temps of last year it really wasn't so bad. For running it would probably be ideal; I just had to slog through an hour or so of pre-race chilliness. The walk to the corrals felt unusually long this year but I'm sure it was the same as usual. I hit up the porta potties before taking my place toward the front of corral C. A DJ (the same DJ? 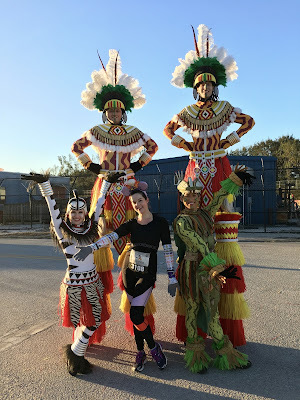 I honestly couldn't tell you) led us through some dance styles before the usual runDisney team showed up to do the announcement stuff. You know, it occurs to me that they haven't trotted out Sean Astin in awhile. Is he still doing these races? Finally it was time to start the race, and the announcers informed us they would be sending off each wave with a different Disney song from the last 25 years to commemorate the 25th running of the marathon. I hope and prayed and IT HAPPENED: as I crossed the start line, "I'll Make A Man Out Of You" from Mulan was blasted over the speakers! AMAZING. That probably made me start off too fast, but whatever - I started off the race in a lovely mood, mouthing the lyrics to myself and grinning ear to ear. We followed the usual course, passing a high school band as we ran away from Epcot and toward the Magic Kingdom. 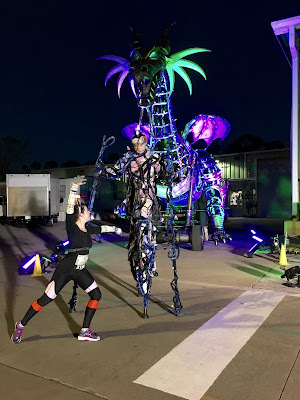 I snagged a Move It Shake It stiltwalker high five before passing under the MK parking lot entrance. 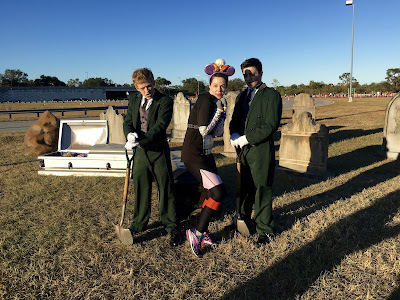 My plan was to stop for the photo op with Jack Skellington and Sally and take my hoodie off while waiting, but they weren't there this year. Instead it was a couple villainesses. But I figured, what the hell, this is what Disney races are for - so I stopped for some pictures. The Dapper Dan behind me was kind enough to hold my Figment ears while I pulled off my hoodie. Soon enough we were running into the Magic Kingdom proper (via the front entrance - that normally the case?). I ran down Main Street toward the castle and felt that very specific joy only the marathon can bring. 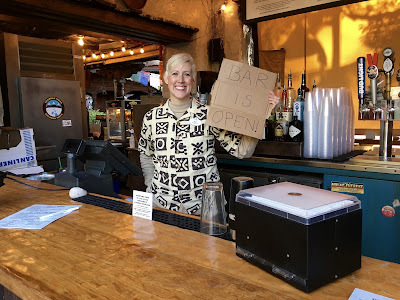 We hung a right into Tomorrowland before swinging through Fantasyland and on into Liberty Square, where I kept a lookout for JJ and Sam Eagle - but this year they weren't out. That seemed to be a bit of a theme for this section of the race in particular. I saw no Country Bears, and Brer Fox and Brer Bear of two years ago hadn't made their return. During this period I kinda had to pee. 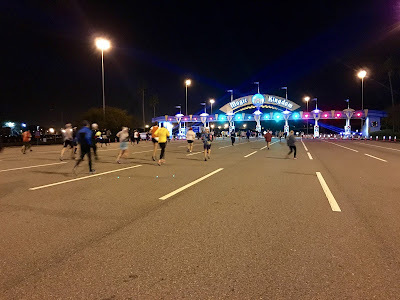 This was fine; I traditionally stop during every marathon at the restrooms between Fantasyland and Frontierland. But - issue! The line for the Woody photo op stretched across the entrance. Blast. And wouldn't you know it, that was the last real bathroom opportunity. 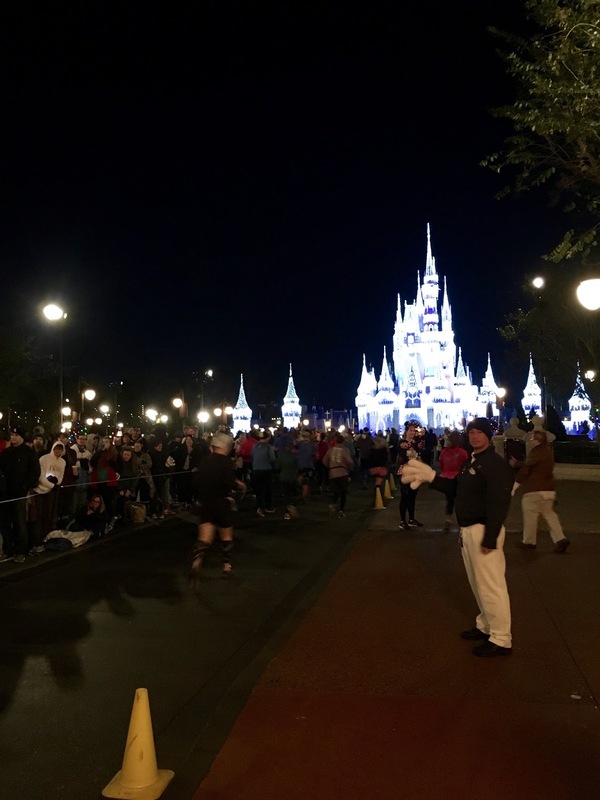 Luckily the next set of porta potties were fairly near, and since most people had already gone in the parks there was no real line. I didn't lose too much time. At least not as much as I lost mucking up the angles on the Maleficent float photo op. Up to that point I was feeling gooood. Probably too good - a victim of the adrenaline and excitement that makes runners start marathons too speedily. I started the beginning of my first decline a little past here, around mile 9. Very early in the race for a wall, I know. Probably the sewage treatment plant didn't help. I perked up considerably on a stretch of road dedicated to extinct attractions. My hopes rose when I heard the original Journey Into Imagination theme song - would they trot out Dreamfinder? But alas, it was just part of a music loop. Some old ride vehicles met me but no lost loves. 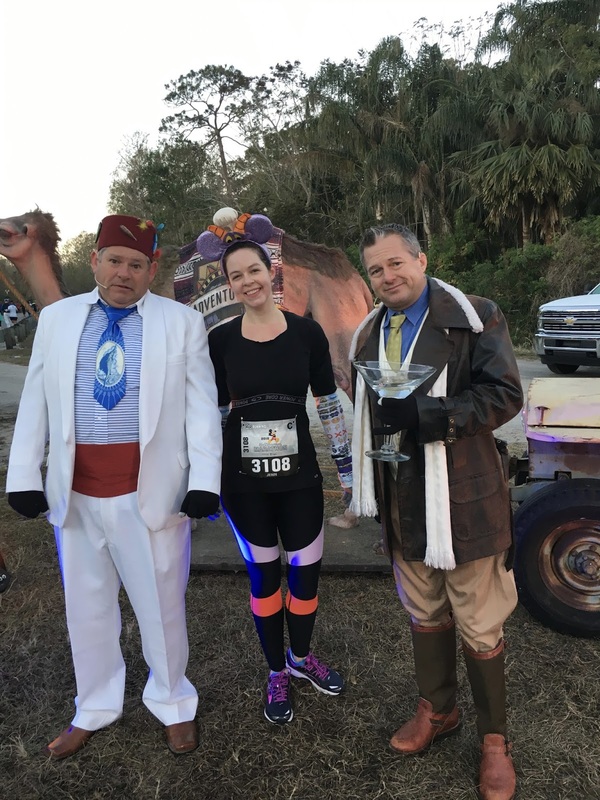 I did run across some denizens of the late lamented Adventurer's Club, and while I never got a chance to patronize this establishment personally I have a sort of surrogate fondness for it; I stopped for a photo. KUNGALOOSH! we all cried. Then we were heading into Disney's Animal Kingdom, where I got my obligatory shot with the Festival of the Lion King performers. 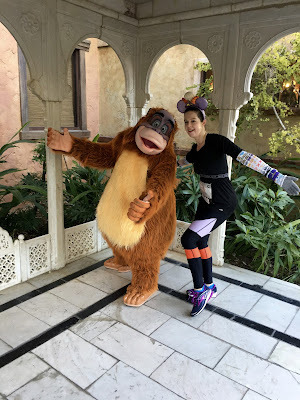 I also stopped for photos with Timon and Rafiki and King Louis, and yes, at mile 13.1 the bar was open! It was too early to ride Everest, so I rolled out of Serka Zong, past the Rivers of Light area and into Dinoland USA before exiting the park. While leaving DAK is of course sad, the line of spectators that hang out by the entrance is a nice pick-me-up. Unfortunately this is followed by what I now consider to be the worst stretch: the miles between DAK and ESPN Wide World of Sports. This is where I hit my second, admittedly smallish wall. Well, it's not so much that I hit a wall as that my morale dips. Anyway, my mood was dipping here. My IT Band was holding up nicely but my entirely right leg just kinda generally felt unhappy. My split times up to that moment, while not terrible, weren't great, and I anticipated continuing slippage as the race progressed; I'd never managed negative splits at marathon distance. Maybe this is a universal feeling. Maybe that's why the Haunted Mansion gravediggers are always positioned here. Nevertheless I trudged along. There was a time when I considered the WWoS area to be the worst part of the marathon, but last year I rather enjoyed it and this year it cheered me up to a surprising degree. I stopped for a photo with Minnie but my cell phone shot sucked so we're just gonna skip past it. We ran on the track before hitting one of the back roads, where an entertaining DJ regaled us with some dry humor. He welcomed us to "the middle of nowhere" and then fielded suggestions about what could make the area more interesting, including a bread factory but NOT a bacon factory because that's a slaughterhouse and that's no good. 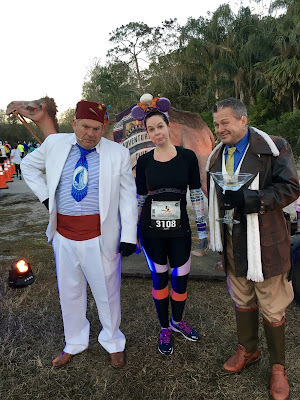 This might be a good time to note that one of the things I find amusing at the WDW Marathon is all the swearing. By this point in the race there were f bombs flying left and right and it made me laugh because you'd so be in trouble on a normal day in WDW. But it's marathon so yippy-ki-yay mother******. After a jaunt through the baseball stadium we exited WWoS - and that, of course, when you know you're in the home stretch. An announcer had recently informed us, around mile 19, that the back of the pack was just getting to mile 8, so I was feeling pretty good. In fact, I was feeling weirdly good. The green army man barely needed to encourage me up the hill (although he did beat me to the top). Then we were there - in the Studios! And I started to feel that feeling - the super happy giddy feeling that is not only a runner's high but a runDisney high. By the time you get to the Studios the parks are open and random people are there to cheer you on. My leg issues had somehow worked themselves out. I was getting call outs for Figment left and right, and one guy in Mickey gloves requested a Figment fist bump. We ran out of the Studios and onto the path to the Boardwalk, and while I knew exactly how far I had to go I was thrilled. By some great miracle, I was on track to beat my personal record. I KNOW! With all those photo stops and everything! This was filling me with wonder, and the always amazing Boardwalk area spectators were fabulous too. They were encouraging me - one lady even told me I had good energy AND looked pretty, which at mile 24 of a marathon is NOT A THING but it made me smile. Then we ran into Epcot, where some incredible genius had decided to replace the usual Epcot background music with Disney songs - and as I entered the park "Go the Distance" from Hercules was playing. Delightfully apropos! But next... oh, man, I'm getting emotional just thinking about it. Next was "How Far I'll Go" from Moana, my Song of the Training Cycle, and it was perfect. My brain practically turned over in my skull, such was my ecstasy, running through World Showcase to the song I had daydreamed my race to so many times. My throat convulsed and I nearly cried. I DIDN'T, but wow. That feeling. Such a good feeling. This is why Disney gets all our money, people. Mulan had no line in the China pavilion and I normally would've stopped for a photo, but I had a PR in my sights and I was feeling fabulous; there was no stopping now. We did make eye contact, and she called out that she liked my Figment ear helmet. See? Best race ever. I ran out of World Showcase and down the bridge, past Spaceship Earth as the song faded out, replaced by "Friend Like Me" from Aladdin. Then between the gospel singers, the finish line in sight... and I punched it, high-fiving Chip or Dale or maybe an imposted chipmunk who even knows because I WON THE RACE AGAINST MYSELF. 4:47:44, kids! That's a PR of like 9 minutes! 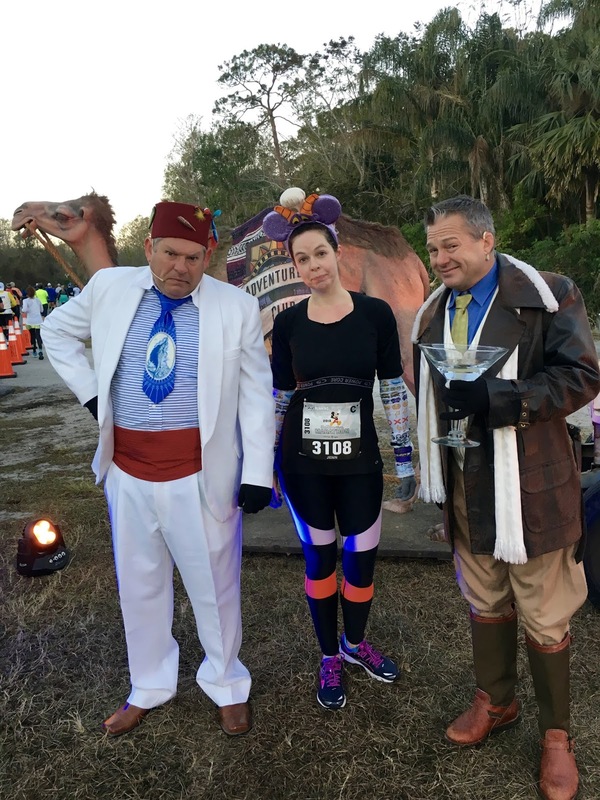 At the WDW MARATHON where I stop ALL THE DAMN TIME!!! I was so happy. SO HAPPY. 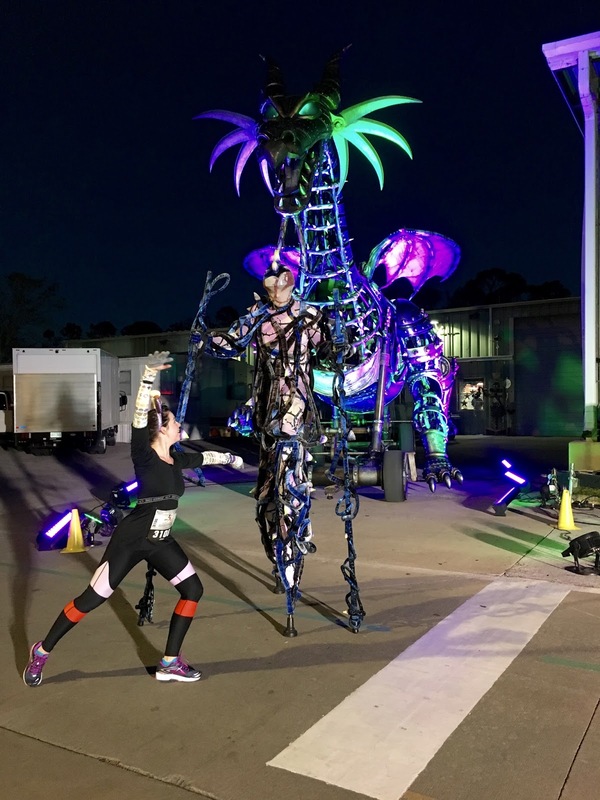 And I must've looked freakin' happy, because as I was intercepted by the runDisney media team and briefly interviewed about my race. I'm not sure where it'll appear if anywhere, but I'm sure I sounded like an idiot. There was a joyous tremor in my voice as I spat out words of praise at a mile a minute. I'm gonna stop here because as per usual I am longwinded as hell. Needless to say this race was AWESOME. I'll never consider not running it again! Up next: my time in the finisher's village and some roaming around Disney Springs. Congrats! The WDW Marathon is so much fun! That is amazing!! Congrats! Reading this makes me want to do the WDW marathon again. When I ran it I was dealing with so many other things, anxiety/sickness unrelated to running, that I never got that high of feeling like I accomplished something. I just felt relieved I actually finished. So I suppose I need a do-over someday!